HOME > Blog > News > Court Cases > Is it an SCRA Violation to Attempt to Collect Fees on an Aborted Foreclosure? As a lender, you may know that it is an SCRA violation to initiate foreclosure proceedings or charge late fees to charge servicemembers on active duty without first getting a court order.But what if they aren’t on active duty anymore? 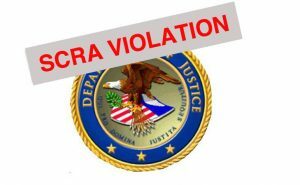 What Constitutes an SCRA Violation? In Brewster v. Sun Trust Mortgage Inc., the U.S. Court of Appeals for the Ninth Circuit reversed and remanded a case regarding two foreclosure proceedings. The first imposed charges and fees that covered a five-month period during with the borrower was on active military duty and subject to the protections of the Servicemembers Civil Relief Act.The SCRA is quite specific in Section 533(c) (codified at 50 USC 3953) where it prohibits the “sale, foreclosure, or seizure of property for a breach of [a mortgage that originated before the servicemember’s military service] … if made during, or within one year after, the period of the servicemember’s military service.” [Note: the one-year period has changed over time and is scheduled to change to “90 days” on December 31, 2019 unless extended further by Congress. ]The only time a lender can institute or continue such a proceeding is when the court gives specific approval . The lender filed the requisite affidavit of military status after having conducted its active duty verification. But then it discontinued the foreclosure.A year after the borrower had left military service and the protections of the SCRA no longer covered him, a successor servicer instituted a foreclosure. It included some fees that had incurred during the first, aborted foreclosure.Even though, after the filing of the lawsuit, the second servicer agreed to waive the disputed fees, the Brewster court found that the attempt to collect these fees constituted an SCRA violation.“[The removal of the fees] does not impact the analysis of whether or not the SCRA was violated in the first place, because we hold that the attempted collection of fees incident to a Notice of Default was itself a part of the foreclosure proceedings barred by the SCRA. 50 U.S.C.” Brewster, f.n.2.The lender argued that the “foreclosure” referenced in Section 533(c) should refer to only the second proceeding and not to actions of its predecessor. It further alleged there had been no “foreclosure” in the first instance, because title did not pass at a foreclosure auction or similar event.The court rejected that analysis for two reasons. First the court found that, lenders should not narrowly construe “foreclosure” as the actual sale of a property. This did not even occur in the first instance. It refers to the entire process, as opposed to a specific act, and includes statutory steps.Second, the court held the statute bars “’sale, foreclosure, or seizure of property.”This suggests that foreclosure must mean more than just a sale or seizure. 50 U.S. app. § 533(c); Spencer Enters., Inc. v. United States, 345 F.3d 683, 691 (9th Cir. 2003) (noting the “cardinal rule of statutory interpretation that no provision should be construed to be entirely redundant.”) We must move beyond the statute’s explicit terms to determine exactly what the word “foreclosure” encompasses.The court did not address the issue of punitive damages collectible under §597(a) when there has been an SCRA violation.